Transportation will be required from 5 March until 31 October for about three return trips from Lvov International Airport to the International Peace Keeping and Security Center (IPSC) in Yavoriv. In February, Washington confirmed it will send troops to Ukraine to train Kiev troops fighting against the militias in eastern Ukraine. “We’ll train them in security tasks, medical [tasks], how to operate in an environment where the Russians are jamming [communications] and how to protect [themselves] from Russian and rebel artillery," US Army Europe Commander Ben Hodges was cited as saying by Reuters on February 11. The Ukrainian government requested the training as "they work to reform their police forces and establish their newly formed National Guard," Pentagon spokeswoman Lt. Col. Vanessa Hillman told Defense News in January. Funding for the mission was requested by the President Barack Obama administration in the fiscal 2015 budget and comes from the congressionally authorized Global Security Contingency Fund (GSCF). 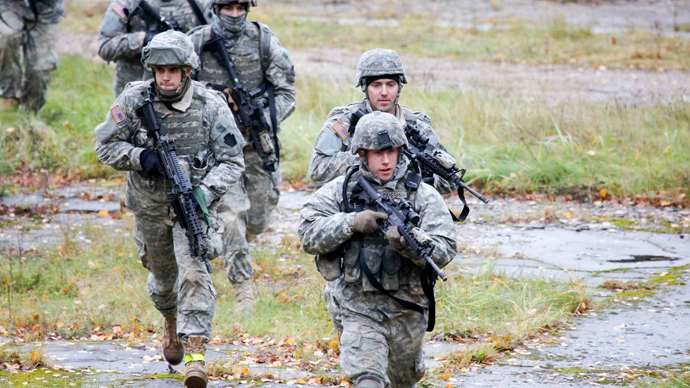 The US is reportedly ready to spend $19 million to put the Ukrainian National Guard through its paces. The UK has followed the US and is planning to send up to 75 British military personnel in March. They will offer medical, intelligence, logistics and infantry training to the Ukrainian army. Prime Minister David Cameron said in February that UK support would be given “well away from the area of conflict,” adding that the purpose of aid would be to improve Ukraine’s tactical advantage. Poland voiced support by saying that Warsaw will send military advisers to Ukraine. "The defense ministry intends to send Polish instructors to support the training of Ukrainian non-commissioned officers," Defense Ministry adviser Boguslaw Pacek told Reuters in February. The Yavoriv operations site, near the Polish-Ukrainian border, is the largest military firing range in Europe, covering 40,000 square kilometers. The last international military exercises in the Lvov region took place in September 2014. About 1,300 servicemen from 15 countries, including the US, Canada, Germany and the UK participated. Despite the Minsk-2 peace agreement brokered on February 12, Washington is still mulling over sending weapons to Ukraine. British Defence Secretary Michael Fallon previously warned that supplying weapons to Ukraine would worsen the conflict, Reuters reported in February. The White House has also admitted that possible military assistance from the US to Ukraine could increase violence. “Providing additional military assistance could and is likely to have the effect of increasing the bloodshed,” White House spokesman Josh Earnest said on February 5.